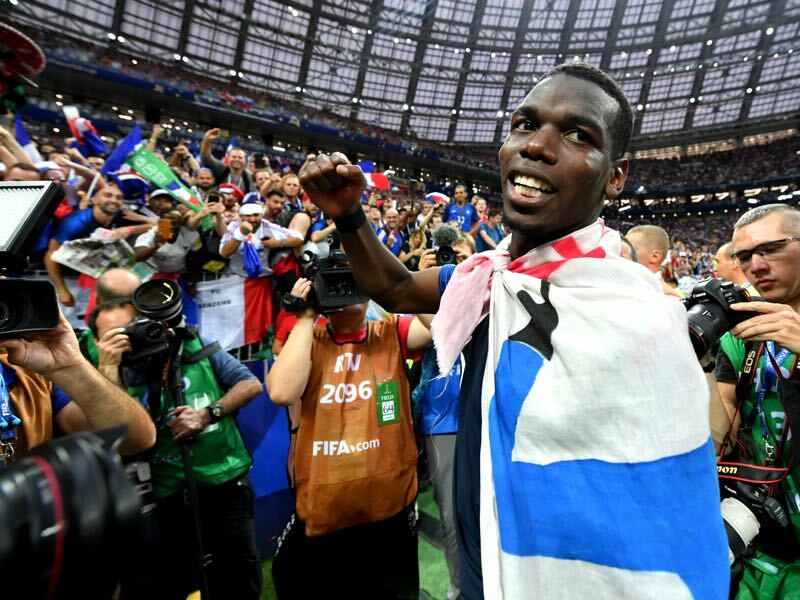 France v Croatia was the grand conclusion of what has been a spectacular tournament in Russia as the final was a six-goal spectacle at which end France were crowned champions. The rain hammered down onto to the pitch. It was almost like tears of sadness as Croatia received their second place medals as France ended their run on Sunday night. 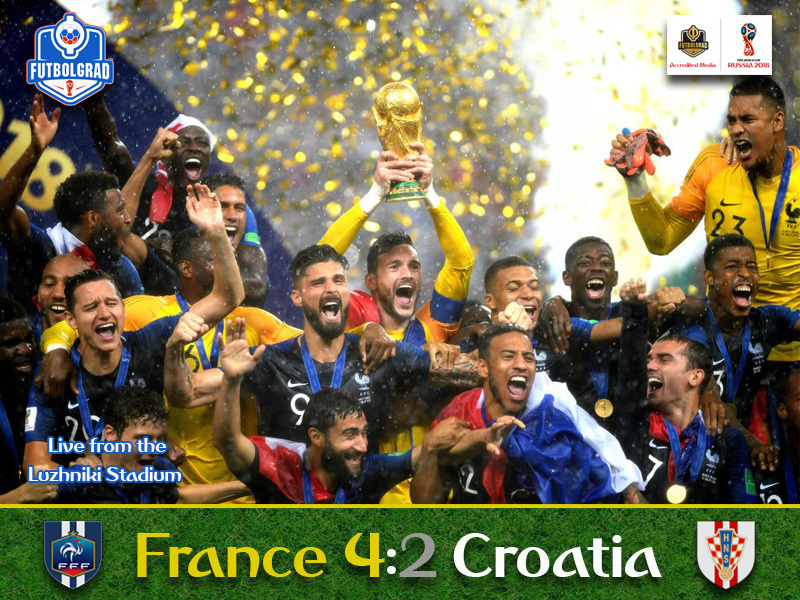 For France, the rain, however, must have felt like tears of joy as they wrapped up their second ever World Cup title with a 4-2 victory. Croatia have been one of the most physical teams at this tournament and not surprising the Vatreni began the match pressing France high up the pitch. It was a high press that caused various problems for the Equipe Tricolore as France’s defence almost seemed to collapse from the flanks into the centre of the pitch. It took France until the 20th minute, to create a significant chance. Antoine Griezmann was brought down on the right flank. The Atlético Madrid winger then stepped up to curl the free-kick into the box where Mario Mandžukić extended the ball with his head into his own goal. The goal put the match on its head as it was Croatia, who had the better part of the match up until that point. It was the third match in a row in which Croatia had gone down a goal. The previous three occasions the Vatreni was able to fight its way back. The question inside the Luzhniki at this point was could they do it again? Tactically, Croatia responded to the goal the only way the Vatreni seem to be capable of – with an aggressive forecheck that seemed almost headless at times. The tactic worked. In the 30th minute, Croatia were awarded a freekick 30-yards from Hugo Lloris’ goal. Luka Modrić send the freekick deep down the flank where the ball was headed to the centre and then extended by Mario Mandžukić, the ball would end up on Ivan Perišić’s feet at the edge of the box, and the Inter midfielder sidestepped a France defender and hammered the ball home from 16-yards. 35 minutes in referee Nestor Pitana made history for becoming the first referee to award a penalty using VAR. Perišić had handled the ball after a France corner, and after several minutes of review, Pitana pointed to the spot. “I wasn’t even sure why there was a review. When the penalty was eventually awarded I didn’t even think about it being a championship match,” Griezmann later explained to the media. It was a controversial decision that once again highlights that VAR cannot determine grey areas and as Pitana pointed to the spot thunder sounded from the Moscow sky almost to underline the gravity of what happened. Stepping up to the spot was Antoine Griezmann, and the Atleti forward showed no nerves sending goalkeeper Danijel Subašić flying into the wrong corner. “We played well the first 20 minutes. Then there was that own goal and then the penalty. Let me say that you should never give a penalty like that in a World Cup final,” Zlatko Dalić concluded. Once again Croatia reacted with aggressive forechecking trying to force another equaliser right away, and while the chequered shirts managed to pump one ball after another into France’s box, the Equipe Tricolore managed to hold on carrying the lead into the second half. Croatia came out of the tunnel looking determined to equal the score once again and in the 48th minute had their first big chance. Pacing through midfield Ivan Rakitić played a no-look pass to Rebić, who had stolen away from France’s defence, and Lloris had to do well to tip his shot from the left corner of the area over the crossbar. The Vatreni now controlled the match with 61% ball possession. Modrić, in particular, often circled by four or five French players, tried to decode France’s game. Slowly but surely inching up the field the tactical orientation gave room to France to hit Croatia on the counter. In the 51st Kylian Mbappé escaped Croatia’s defender Domagoj Vida and Subašić had to come out to challenge the French teenager inside the penalty box. A counter-attack then brought the decision in the 59th minute. A long ball found a streaking Mbappé, who beat his defender on the wing and then played the ball to the centre where Griezmann was waiting. Taking the ball on with his back to the goal he managed to lay it off for Paul Pogba, and the midfielder made no mistake to score from 18-yards out. Just five minutes later France added another. Lucas Hernandez played cat and mouse with three Croatia defenders on the let wing, spotted Mbappé in the centre and the French teenager scored with a low drive from 25-yards out. At this stage, the World Cup final seemed wrapped up. But then Lloris handed Croatia a lifeline – stopping a pass back in the 69th minute, he failed to see Mandžukić closing on him, and the Croatian striker managed to redirect the ball from Lloris’ foot into the goal. Croatia certainly believed in it. Two goals down with the time running out the Vatreni laid siege to France’s penalty box. Passing the ball around the area looking for that opening that would allow them to further close the lead. France, on the other hand, were pragmatic at this point. Sitting deep they allowed Croatia to control the ball in the attacking third but shut down passing channels and did not let the Vatreni advance into dangerous shooting positions. As a result, France managed to close the game out securing their second World Cup title in what was an attractive World Cup final until Croatia’s second goal. After that, the Equipe Tricolore shut down Croatia effectively killing the game off. “On our bus, it says we are a small country with big dreams. This is a great message for smaller countries at the World Cup. You should never give up. Even at 4-1 down we didn’t give. Overall we played a great tournament,” Dalić concluded. Paul Pogba was the man of the match. The Manchester United midfielder scored what turn out to be the game-winner when he made it 3-1 in the 59th minute. Pogba was also instrumental in keeping his side together when Croatia started to push for a third goal to get back into the match. Managing two key interceptions and four key tackles he also played 30 accurate passes (85.7% accuracy) and finally won ten out of his 18 duels. What a conclusion to a spectacular World Cup. The game between France and Croatia was a six-goal thriller as the world witnessed a tournament in which only one game ended in a 0-0 draw (France against Denmark). Although the tournament saw some spectacular games, the record of 171 goals scored in Brazil remains untouched. Overall, fans in Russia were witness to 169 goals. Didier Deschamps has become the third person to win the World Cup as a player and as manager after Mario Zagallo and Franz Beckenbauer. Olivier Giroud didn’t attempt a single shot on target in 546 minutes at this World Cup for France. Mario Mandzukic is just the second player in World Cup history to score a goal for his side and an own goal in a single game, after Ernie Brandts for the Netherlands versus Italy in 1978.